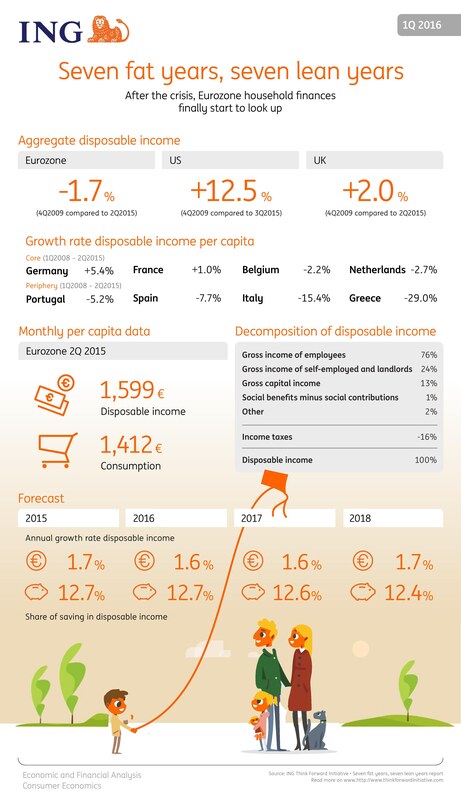 Household incomes in Europe are recovering, and are likely to exceed their 2009 peak later this year, according to an ING economics report released today. Seven years into the financial crisis, household incomes in Europe are only now just approaching the 2009 levels, most likely mid this year, according to the Seven fat years, seven lean years report. However, an economic pick-up underway over the past two years will result in incomes exceeding the 2009 level by 4.3% in late 2018. The report said that income inequality between Eurozone countries had increased markedly, during the financial crisis. However, it said the income divergence between European core countries (for example, Germany, the Netherlands and Belgium) and peripheral countries (Italy, Spain, Greece, Portugal) should lessen in 2016. The report found that household consumption in the Eurozone is forecast to grow at the same pace as disposable income in 2015 and 2016, but exceed it slightly in 2017, as households ease back on debt repayments. The ‘Seven fat years, seven lean years’ report is part of a series being produced for the Think Forward Initiative, an ING project, which aims to gain a deeper understanding of personal finance decision-making. It plans to use those insights to help people make better financial decisions. A full copy of this report can be downloaded below. There is also a one-page summary available of the report. Download it below.